Your appreciation (and mine) of this book is contingent on the answers to two questions: Is your turning expertise above average? Do you turn for fun or fortune? If your turning capability isn't up to it, the subtitle of this book ,"Projects & Inspiration for the Skilled Turner", could and probably should scare you away. If your wallet requires some minimum output of turned and sold work, this book will definitely tempt you but should probably be passed by. But if you're like me, turning for therapy, with no challenge left unanswered even if it requires you to miss some Stanley Cup telecasts, then Sterling Publishing and Gary Roberts have thrown down the gauntlet with this publication. Here are projects that challenge and inspire the best artisans. It is whispered by some Texans in and around Austin "that Gary Roberts has too much time on his hands." I don't subscribe to that thinking. No one could have a free schedule and be able to create the works contained in this book. There is an abundance of projects, an amazing amount of detail, the total absence of the kind of fluff that seems to provide filler in too many books today, and a goodly sprinkling of good ol' country humor that I haven't heard enough of since my Dad died. I can say, from personal first-hand experience, that woodworkers who know Gary Roberts speak very highly of him. Although we have only exchanged mail, after reading his book I think I've gotten to know the author well enough to say that he certainly would "fit in" back in the sticks where I come from. The book is soft cover, 160 pages. There are single pages of author's acknowledgements, a poem, and a Table of Contents. Six pages of introduction follow, and to the author's credit, it truly is not only introductory but also mandatory. Don't start most any of these until you read the introduction. Then there are thirty-three (yes - 33!) projects. Some of projects are certainly easier than others. The Wine Bottle Stand and the Twig Pot are quite straightforward, yet both require precise machining and the assembly of multiple turned pieces. Some projects incorporate carved embellishments along with quite a lot of detailed assembly. And then there are some projects that are almost too busy to be believed, like the Mashrabeya Vessel (mashrabeya is Egyptian, meaning "a drinking thing"). I counted 150 spindles in this project, so if you need some practice with multiples this is your kind of work. Several projects incorporate music box hardware for mechanical movements. Many projects require templates for marking out the positions of design features. Many projects require the creation of jigs, which are needed to position or support the various project pieces as they are being turned, hollowed, carved, or drilled. 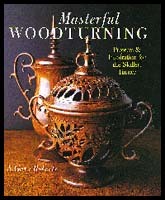 Just the variety of methods presented in the book for hollowing vessels makes this book worthwhile. "I always wondered how they did that - now I know." This book is what turning for pleasure is all about. The author spends no time in talking about "riding the bevel" or "cutting downhill" or "special grinding" or any other basic cutting technique. He assumes the reader can turn - and well. This book is all meat, with page after page of different designs and then the special techniques necessary to create those designs. The author spends his time showing us how to hollow a seemingly impossible decanter, and then another, and then yet another, all different in style and approach. There is so much technical content here, that there will be a "must do" project in this book for everyone. My compliments also go to the author and his helpers for the style they chose to use in the book. Simply put, it reads well. Not all, actually damn few, technique-heavy books are fun or easy to read. This one is. Finally, no doubt, this book is not about craft, although a very high level of craftsmanship is required. This is Art.